Photos by Seth Arkin except as noted. 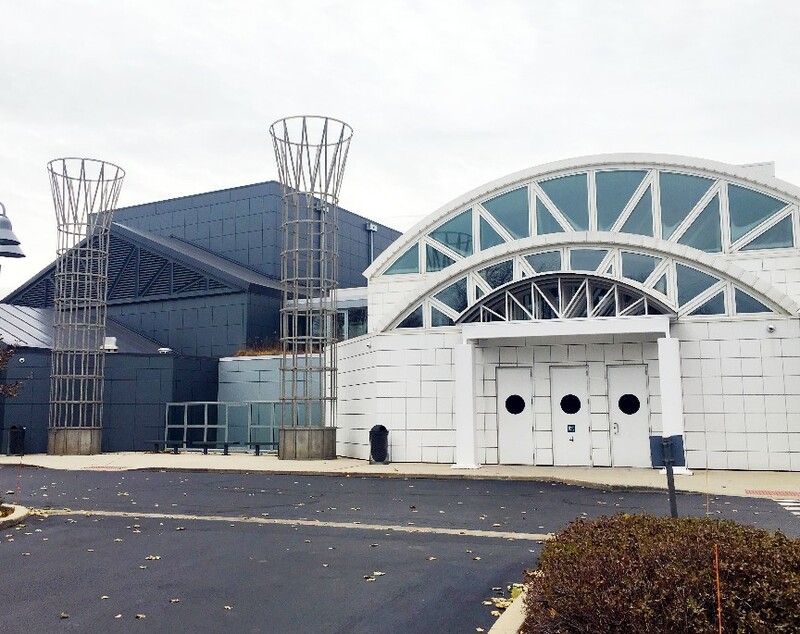 The Illinois Holocaust Museum in Skokie stands as a testament to men and women who--as children--survived the worst horrors imaginable and opted to share their anguished past in hopes of creating a more positive future. 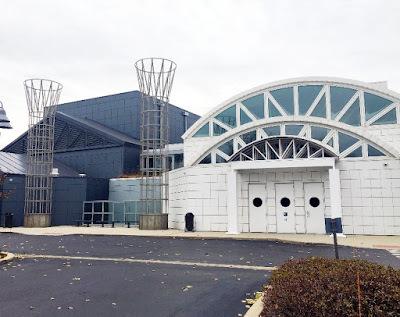 While the museum has told the survivors' stories since 1981--and since 2009 in the impressive structure at Woods Drive & Golf Road--the museum's new Take a Stand Center (which I explored in November and wrote about here) highlights several "Upstanders" who, in various ways and places, have improved the world amid considerable challenge. 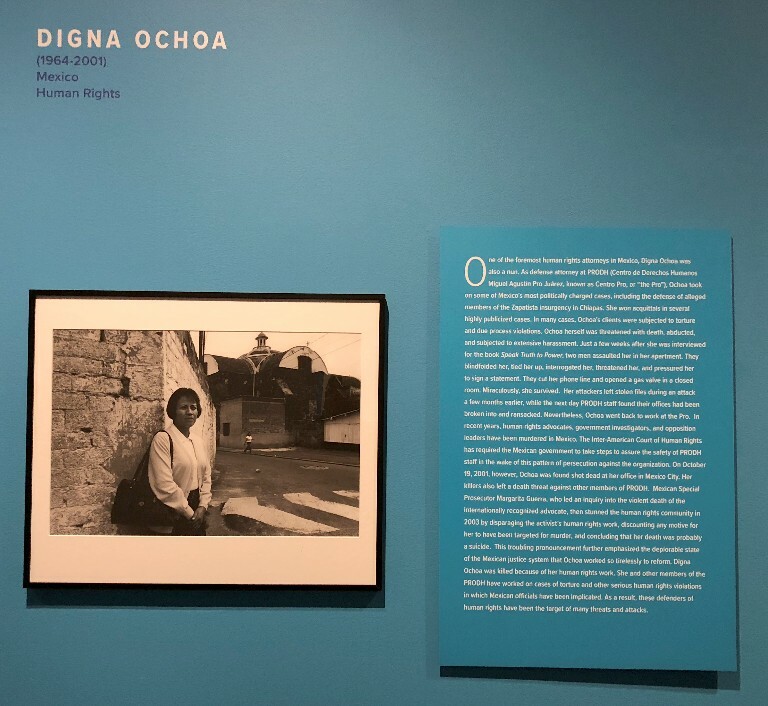 Well-complementing the Take a Stand Center, the IHMEC's new temporary exhibit, Speak Truth to Power, similarly highlights many admirable "Human Rights Defenders Who Are Changing Our World." 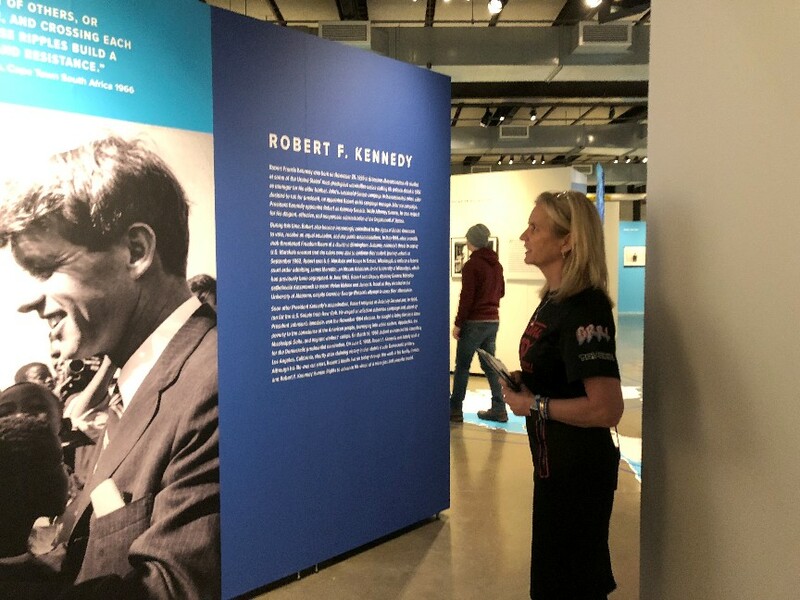 And it exists because Kerry Kennedy had the resiliency to overcome her own childhood tragedies--the quite public assassinations of her uncle, President John F. Kennedy, and father Robert F. Kennedy--and devote herself to doing great good in the world, while spotlighting those who have done likewise. 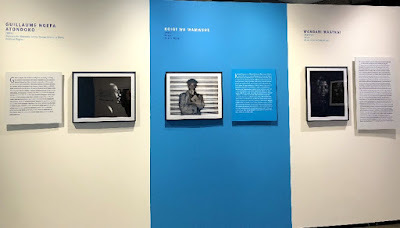 Speak Truth to Power, the exhibit that will run at the Illinois Holocaust Museum through June 24, is based on a book Kerry Kennedy published in 1998--it was reissued with a Students' Guide in 2016--and likewise features photographs by Eddie Adams and brief biographies derived from interviews Kennedy conducted over 2-1/2 years. 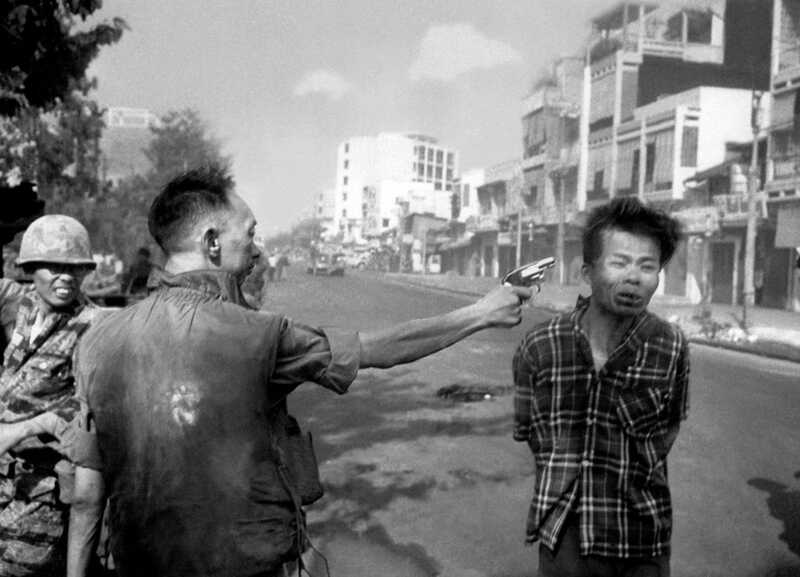 Adams passed away in 2004, but had extensively covered the Vietnam War and won a Pulitzer Prize for his photo of a South Vietnamese police chief executing a Viet Cong prisoner on the streets of Saigon 50 years ago this month. 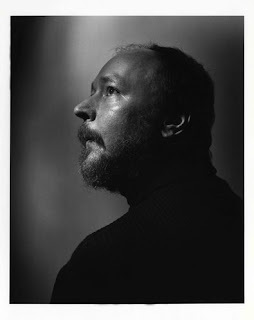 His work was also featured in numerous prestigious publications. Kennedy, the 7th child of RFK and his wife Ethel, was at the museum on Sunday, Feb. 4 for a public presentation about the new exhibit, and a press tour on which I participated. Now 58, Kerry is the president of the Robert F. Kennedy Center for Human Rights, which engages in a variety of activist causes reflecting the late Senator & Attorney General's principles of "compassion toward one another, and a feeling of justice toward those who still suffer." 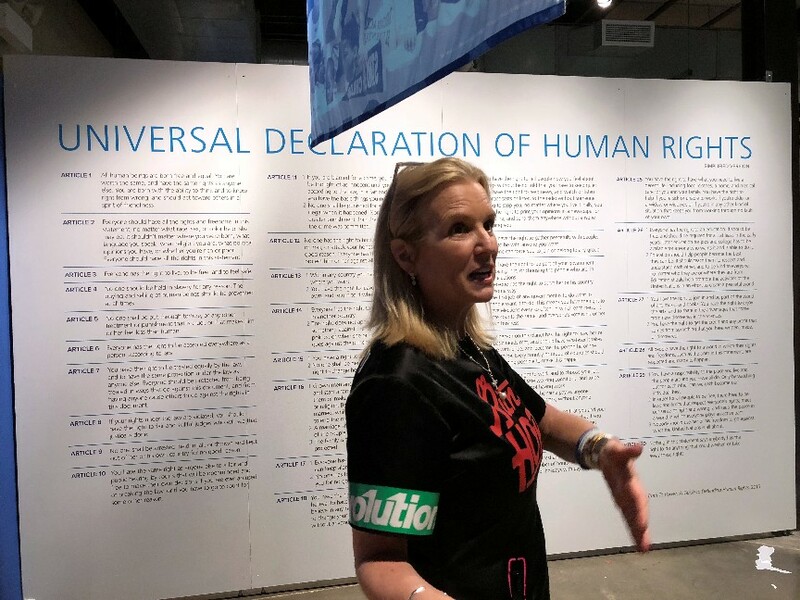 Also central to the Speak Truth to Power book, and Kerry Kennedy's overall stated mission, is the "Universal Declaration of Human Rights," which was adopted following the Holocaust and is prominently featured in the temporary exhibit, as well as within the permanent Take A Stand Center. 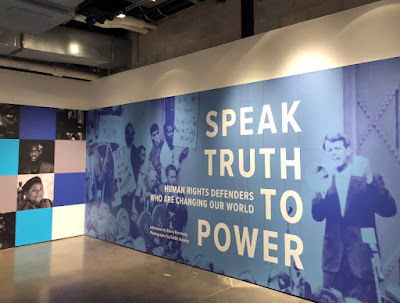 Though the Speak Truth to Power exhibit also highlights well-known subjects such as Holocaust survivor & author Elie Wiesel, poet turned Czech president Vaclav Havel, the Dalai Lama and Sister Helen Prejean (author of Dead Man Walking), the vast majority of the Human Rights Defenders showcased were names unfamiliar to me. In both her speech to a large gathering of museum visitors and during her tour for a few journalists, Kennedy showcased Digna Ochoa and Gabor Gambos. Kennedy relayed how Ochoa--a nun turned human rights lawyer in Mexico--told her about learning that a local woman's husband had disappeared. This prompted the lawyer to sneak into a military hospital to find him, order two armed guards out of his room, sign the man up as her client and stand her ground amid subsequent threats from the guards. "I was just so angry." Sadly, Digna Ochoa was killed in 2001. Gabor Gambos--who you can read about here on the Robert F. Kennedy Human Rights website, along with several others, including many individuals added since Speak Truth to Power was initially published--is a Hungarian astrophysicist and mental health advocate. Kennedy shared how at a Speak Truth to Power event in Romania, where Gambos was being honored, he courageously spoke of his schizophrenia. "But because you gave me this podium, you're listening to me." Besides listening to Kennedy in both milieus, I spent some time perusing the Speak Truth to Power exhibit on my own. And though, like presumably many a patron, I didn't read every word about every person chronicled, the photographs are highly evocative in their own right. And rather than ingest every last detail about each Defender, I believe the point is to get a sense of the numerous--often unsung--people around the world who turn struggle into inspiration for positive change. As I noted at top, this dovetails quite well with the Take A Stand Center and the Illinois Holocaust Museum & Education Center as a whole, which was founded by survivors and escapees of the Nazi genocide who wound up living in America, and in large numbers, Skokie. 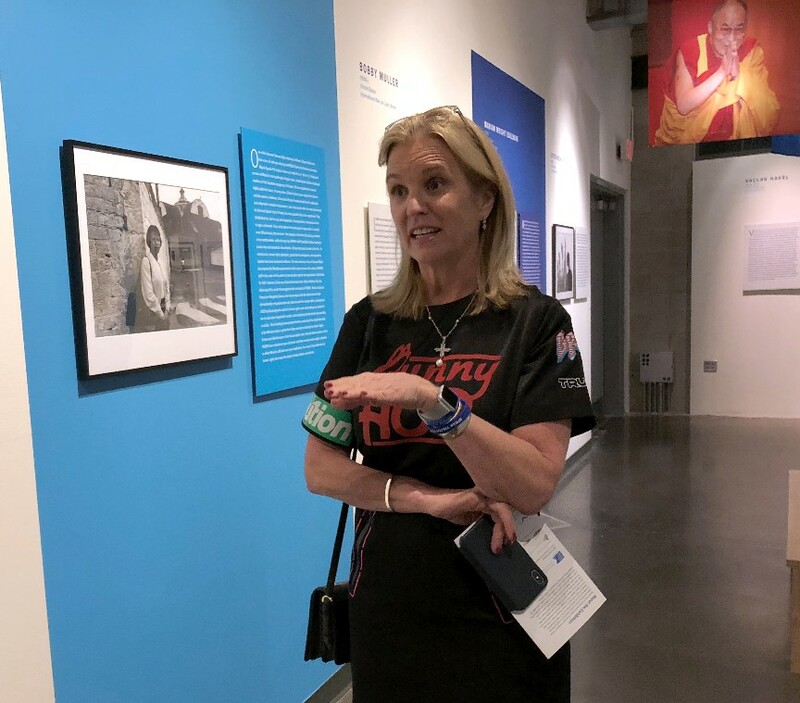 "We're proud to bring the Speak Truth to Power exhibit to the Chicagoland community," IHMEC CEO Susan Abrams told me, while also noting the powerful juxtaposition with the Take A Stand Center and its focus on Upstanders. "There's a need for all of us to be activists and Defenders." Although Kerry Kennedy was quite gracious with her time, I didn't get a chance to ask her how the Human Rights Defenders featured in her book--and the exhibit--were chosen, beyond their being alive circa 1998 (when she interviewed them and Adams took the photo portraits). As I maintain a blog--6wordPortraits.com--that highlights people who have made significant contributions to history, I happened to know that the Sunday of my museum visit, February 4, was the birthdate of Rosa Parks (1913-2005). Parks--and undoubtedly hundreds of other worthy humanitarians--is not to be found in the Speak Truth to Power exhibit (or the Upstander gallery of the Take a Stand Center) so I was just curious if any specific criteria was adhered to, or if it's just impossible to include everyone deserving. Regardless, the Speak Truth to Power exhibit is certainly well-worth a good 40-60 minutes or more to peruse, perfectly complementing a visit to the new Take a Stand Center, and--for first-time visitors--a thorough exploration of the museum's primary collection. Much as the Illinois Holocaust Museum & Education Center's exterior design represents both dark and light, that its latest exhibit provides an uplifting look at those who represent the best of humanity serves to somewhat counteract the very worst of it. All the more so for representing Kerry Kennedy's steadfast resolve to shed light on the good in the world, long past the horribly dark days of her youth.